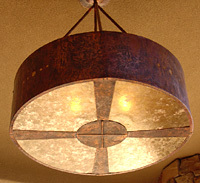 If you visit Mike Dumas's showroom in St. George, Utah, you might see something surprising made out of copper. "Someone comes in and says, 'Hey, can you do this out of copper?'" Dumas says. "And we say, 'Yeah, we can try. That's an interesting idea.'" His Web site includes photos of copper tables, cabinets, doors, water features, bar wraps, countertops, mantelpieces, chimney caps, lampshades, chandeliers, and sconces that often feature a combination of smooth and textured copper. Most of his work is custom, although people can order the items that are pictured on his website. He keeps a small amount of stock, but most of the pieces are made to order for clients all over the U.S., including Hawaii. He also installs the larger pieces, if necessary. Dumas started out in the mid 1990's building wood furniture and incorporating a little bit of copper into the pieces for accents. "The more I worked with it, the more interested I got in copper," he says. In the late 1990's, he began to make full copper pieces. "Copper just seems to be such a versatile material. Sometimes, just a piece of copper in a piece of furniture makes all the difference in the world. We do tables, we do lights, we do mirrors and range heads. I'm still finding uses for it." He got to the point where he was working almost exclusively with copper, but now, he has begun to mix copper and wood together again. Dumas's work involves fabrication rather than casting and focuses on a western and "old-world" style. He's always up for trying something new, however. "I'd like to get into some hot forging of copper," he says, "and I'd like to experiment with electroplating." His business is very much a family affair. 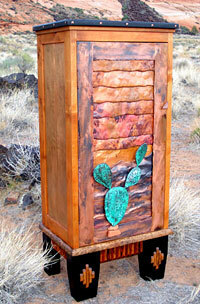 His wife, Julie, creates glasswork that also sometimes incorporates copper. Rather than the lead that is traditionally used in stained glass, Julie sometimes uses copper foil. She takes the pieces of glass, wraps them in a thin piece of copper foil, and solders them together. She has also fused copper screen into clear glass. One piece that they created is a textured copper sconce with amber glass fused into the metal. Their 24-year old son, Coleman, is now welding heavy sinks out of copper for the business. He apprenticed with Dumas for about four years. Dumas's two younger sons have also learned how to fabricate copper, but Coleman is the one (so far) who has become very interested in working with metal. Dumas is known for his hand-texturing of copper and for his original patinas. His texturing techniques are a result of experimentation using different hammers and backgrounds. "That's what I love about copper," he says. "There are so many things you can do to it. You take a bright, shiny sheet of copper, and you can transform it into something that you wouldn't even recognize from what you started with." He has even developed his own tooling for creating the textures, and he sometimes sells the textured sheets by the foot for customers who want to make something themselves without the labor-intensive work of texturing the copper. One of his textures is hand-corrugated to create a pleated effect. He makes a jig out of wood and creases one side of the copper. Then, he flips it over and creases the other side. Since the work is done by hand, he must go back and even it out to make it symmetrical. One of the characteristics of much of Dumas's work is the combination of finishes and textures in a single piece. One chandelier, for example, is made of wood with four cylindrical pieces extending down which incorporate three different looks in each cylinder. One finish is mottled, another is golden, and another section of the cylinders was actually created with wrapped copper screen. He also created a door that consists of squares of copper, each with a different patina or texture to create a "quilted" or "checkerboard" effect. Because they're conveniently located in his town of St. George, Dumas gets most of his copper from Air Cold Supply, which primarily services the air conditioning industry. He loves the idea that recycled copper could have had many lives by the time it reaches him. "When you get a sheet of recycled copper," he says, "part of that might have been copper from the 1700's for all you know."